I was reading about how Kubrik, Lucas, Spielberg and Cameron pioneered the cinematic techniques that we now take for granted. And it was motivating beyond an extent. It is so fascinating to know how once what seemed impossible to achieve was made possible, not in theory but in reality. These cinematic geniuses, throughout their career have ventured into some unexplored vistas and built a special place for themselves in the industry. 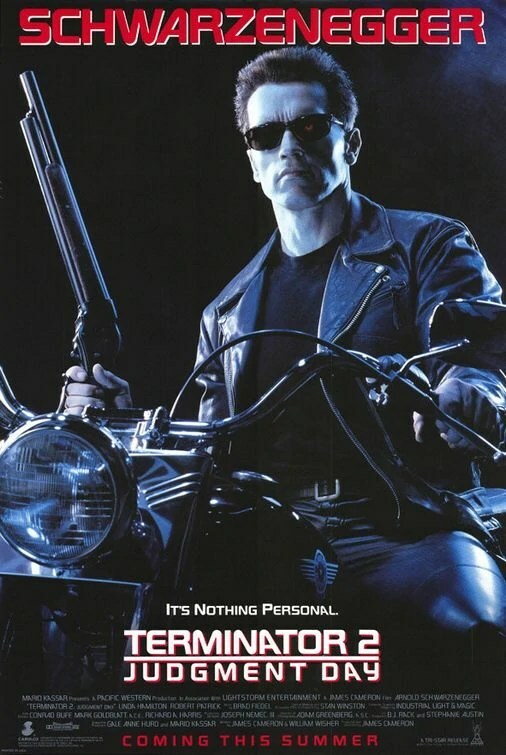 Terminator 2: Judgment Day(1991) is a sequel to The Terminator (1984), which introduces us to the young John Connor, yet unsure of his destiny. Sarah Connor, after attempting to bomb the early phases of Skynet gets arrested and held in a mental asylum. John was brought up believing in a future where humans have to fight the machines they once created. In the current scenario, John is confused and chooses to believe the easier way out that his mother is a mentally unstable and his childhood was based on a lie. John lives with his foster parents, but fails to have an emotional connection with anyone. John Connor of the future reprograms T-800 (Arnold Schwarzenegger) and sends it back in time to protect his younger self from T-1000, an advanced poly-alloy cyborg. Now the most interesting fact about the film is that Schwarzenegger plays the protector over here and not the antagonist. People loved Schwarzenegger in The Terminator as a villain. And this bad guy to good guy change was publicized with great efforts. The trailer emphasized this sole point. The film includes multifarious dimensions to action scenes, including a chase, one-man-army sequences, an against all odds sequence in the end, survival, comeback, melee combat, all in one bundle. There is a giant leap in terms of the use of prosthetics, CGI (Computer Generated Imagery) and natural human motion. If you compare the iconic mechanical face and red eye scene in the first part and this one, you will realize why exactly this film was a breathtaking escalation in visual effects. Needless to say, the film received 6 Academy Awards including Visual Effects, Make-up, Cinematography and Editing. Another interesting aspects about movies in the science fiction era such as Alien (1979), Back to the Future Trilogy (1985 – 1991) and the Terminator series, is Cinematic liberty. These films pioneered visual effects, but unavailability of certain phenomenons did not restrict them from achieving cinematic brilliance. Alien has very few glimpses of the alien, the alien planet and outer space itself. The first Terminator has the Terminator wearing Sunglasses after exposing his cybernetic body underneath his organic cloak. The whole Terminator series assumed and emphasized that no machines can travel through time unless covered with organic material. It is interesting to see how budget changes the plot and makes it what we see on screen. T-800: I know now why you cry. But that’s something I can never do.